505-243-3000 Your freedom is our specialty. You are innocent, until proven guilty. You RING, we SPRING! Even if it takes us ten years. Bernalillo County, Santa Fe, and Nationwide. Benalillo County, Santa Fe, and United States coverage. Amigo Bail Bonds, your freedom counts! 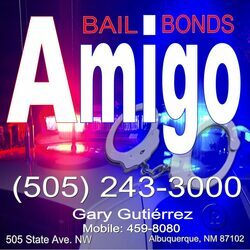 Contact our Albuquerque, New Mexico bail bond agents by calling (505) 243-3000 today.